Equine Guelph’s EquiMania! 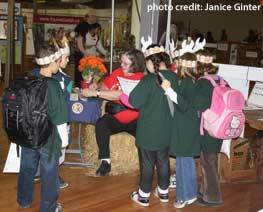 was, once again, a huge success as crowds visited the interactive exhibit at the 2009 Royal Agricultural Winter Fair, November 6th through the 15th. “Play Safe. It’s HorseSense!” took centre stage holding the reins for another ride into the ‘real deal’ of the beloved equine. Featuring impressive displays, Equine Guelph staff and volunteers guided “Danger Detectives” of all ages, as they accepted their mission: scan the barn-like setting (enhanced with bales of straw...but no manure!) and discover 12 safety hazards. 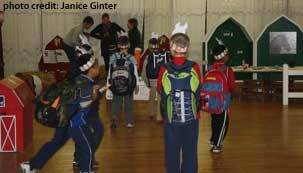 Participants received a great looking back pack, and the presentation of the official ‘Danger Detective’ badge! 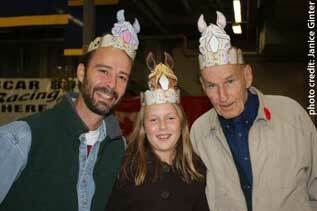 The much desired horse hats were seen on guests of all ages, everywhere! EquiMania!’s spacious display, allowed for the many, urgent messages of safety, around the mock-up of a horse property. Ever present volunteers rotated around the education centre, informing inquiring minds about everything from tractor safety, to understanding equine behaviour and vision. In addition, there were exhibits on nutrition, parasites, and a standardbred set up displaying tack and information on race horses. Grooming tools of the trade were identified to get the job done right. The ever popular “Shortylegs” was a photo celebrity, the “How Tall Am I?” display that explained determining horse height, along with braid a tail, wrap a leg and colour a horse hat kept youngsters busy while tired companions had a rest. Many laughs were heard as tots had their pictures taken in the winner’s circle. Equine Guelph’s Managing Director, Gayle Ecker, is passionately dedicated to Equine Guelph‘s mandate: “...to improve the health and well-being of horses through research, education and performance.” Gayle was available at the exhibit to answer the question; “Where can your love of horses take you?”, hopefully, inspiring potential students of Equine Guelph’s online education programs. “I would like to thank our many volunteers who helped make EquiMania! a success,” says Diane Gibbard, Equine Guelph’s Special Event Coordinator. EquiMania! is groomed to educate in a fun way - and the 2009 Royal exhibit delivered on horsin’ around!